Floating flowers cast a delicate spell of elegance for the design of this scarf. By Vinita, the navy blue scarf is woven of a luxurious blend of rayon and silk. Floating flowers cast a delicate spell of elegance for the design of this scarf. 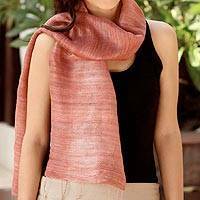 By Vinita, the champagne-hued scarf is woven of a luxurious blend of rayon and silk. 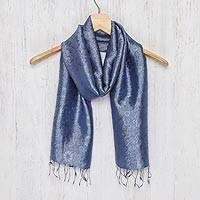 Thailand's Vinita orchestrates shimmering dark and light blue for the design of this scarf. Dyed by hand, the scarf is woven of hand-spun natural silk, resulting in a coarser texture. Vinita plays with bold colors for the design of this silk scarf. Selecting a palette of earthy brown hues, she uses tie-dye techniques to color this trendy scarf.